Paul Cranford receiving the Katherine McLennan Award, an acknowledgement of contribution to culture and historical preservation on Cape Breton. In 1979 Cranfords work began with a reissue of a classic 19th century Scottish compilation, The Skye Collection. Cranford Publications specializes in Celtic fiddle music from Cape Breton, Ireland and Scotland. Proprietor Paul Stewart Cranford is a fiddler, composer and retired lightousekeeper well-grounded in the traditions of music he sells, performs and arranges. This site provides resources for a continuing tradition. We both create and distribute books of music notation and related recordings; materials intended to help you learn to interpret music. We also link to many other educational sites as well as to other fiddlers, luthiers, festivals etc. Our online store has remained the same since 1999. and hopefully during 2019, as time permits we will find time to upgrade the look, feel and functionality of the store making it mobile friendly. As you explore the site you will find links to thousands of tunes. Check out any page which features a book or CD that interests you - on most you will find links to tunes. Many are posted as free, on-screen musical notation others as sound clips, midi files, ABCs or link to articles, photos and descriptions - all relating to books and CDs which we make or have made available in our on-line store. Our on-line store allows secure credit card purchases for all the books and recordings we feature. We also take phone and mail orders. 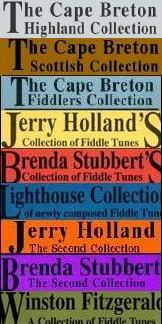 The Cape Breton Musical Heritage Series (currently 9 books) is still being compiled. The long term plan is for a 12 volume set. A classic Scottish book being revised. Paul worked as a lighthousekeeper from 1975-2009. Lighthouses proved to be an ideal place to research, write and practice. Working month on - month off, he started publishing books of fiddle music in 1979 and over the years has published over a dozen collections. His final lighthouse posting was Machias Seal Island a bird sanctuary located on the Canadian-US border in the Bay of Fundy. Since retiring from lighthouses, Paul has settled into full-time life in Cape Breton. 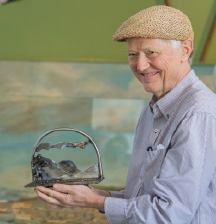 In 2009, he was artist in residence for The Celtic Colours International Festival. In 2010 he released a double CD of original music titled More Tunes from the Lighthouse which contains over 100 previously unrecorded tunes - soundclips & notation are posted for every tune!. In 2011, he once again worked with Celtic Colours, this time producing The Celtic Colours Collection, a book of music to celebrate the festival's first 15 years. In 2015 he was appointed The Patron of World Fiddle Day. Also in 2015 Paul completed The Cape Breton Highland Collection, Vol 9 of his Musical Heritage Series. Currently he is working working on vol. 10, 11 and 12 - the next of which will be titled The Cape Breton Irish Collection. 2016- ongoing project preparing existing collections for eventual digital releases. 2018 - Recipient of The Katherine McLennan Award given jointly by The Fortress of Louisbourg Association (Parks Canada), Cape Breton Regional Library and CBU (The Beaton Institute). If you are touring Cape Breton during the summer months Paul lives across the road from Wildfire Books and Pottery. Located on the Cabot Trail, the shop also carries a good supply of the music books and CDs described on this site.